These students at Chesterfield Elementary school are working on Panorama storybooks (see Studio classes for a close up of the book form). They used them to illustrate and write their own myths in a literacy program. 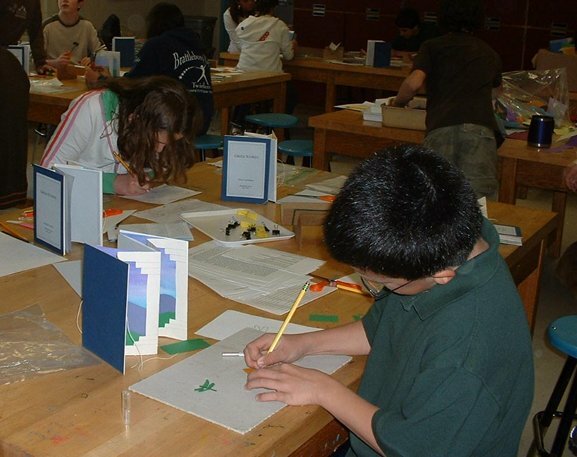 Susan is happy to work with teachers to design meaningful book arts residencies that range from teacher in-service workshops to day-long or weeks-long explorations of bookbinding. 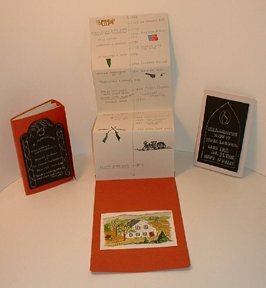 Over the years she has developed a number of unique forms that integrate historical, literary and scientific learning in the process of creating a handmade book. She has taught at the kindergarten through the graduate level in schools and colleges, in a sculptor's atelier in Tuscany, and at libraries and private homes throughout New England and beyond. Third and fourth graders at Wardsboro School used these books to research and write about a character from their town's local history. The books located their character on a timeline showing local and national history and included a painting of a tool the person might have used or the house where s/he might have lived. On the opposite side of the accordion timeline, students wrote imaginary diary entries their characters might have written at their age. 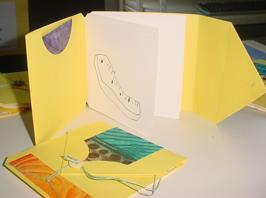 Susan has taught the "Garden Book" to kindergarteners through 3rd graders. It contains a pocket with a paste paper envelope for seeds, a 4" ruler for measuring growth of new plants, and pages to draw the plant's progress. It closes with a "seed button" wrapped with "roots" to anchor it that are the tied threads from its 3-hole pamphlet stitch binding. Developed by Susan as a way for students to share their own autobiographies, this form is adaptable to many uses in social studies and language arts. 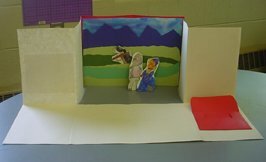 It features built-in puppets and stage (above), and on the opposite side, space for stories (below). 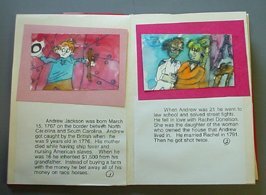 This example was made by a fifth grader at Chesterfield Elementary School in NH, who used it to illustrate research about historical figure Andrew Jackson.